a tour of the Summer decorating at The Kat House! buffet holds two glazed terra cotta lamps made from garden urns. 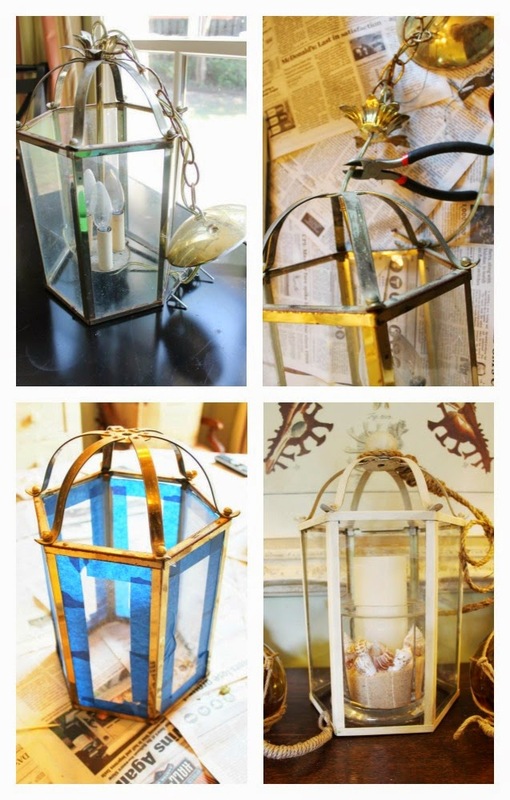 A new item in this vignette that I recently recycled is the lantern. cut the wire and pulled the "guts" out. painted wooden ball knob on top. To add some nautical feel to it I also added some rope. In front of the lantern is a shell that was on clearance at Michaels. that is sometimes used to carve real cameo jewelry. 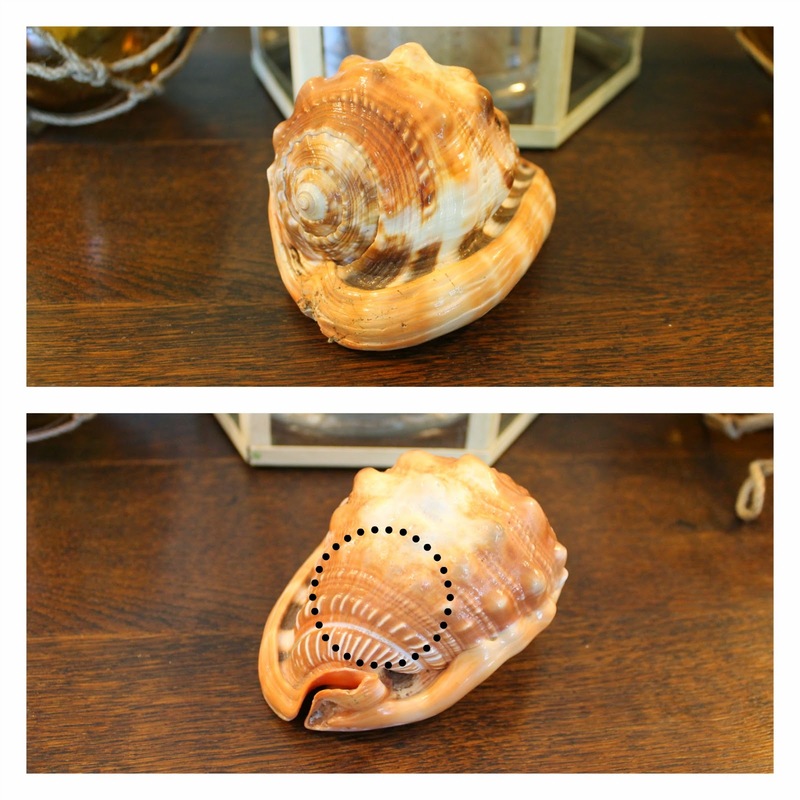 Usually the shell is cut into parts and carved into cameos that are small and used in jewelry. photo above where the dotted circle is. is DIY faux mushroom coral. The other side of the vignette has faux wave coral from Target. the art changed inside of it seasonally. The center of this vignette is a grouping of DIY coral and seafans. made with rope and a pool noodle. 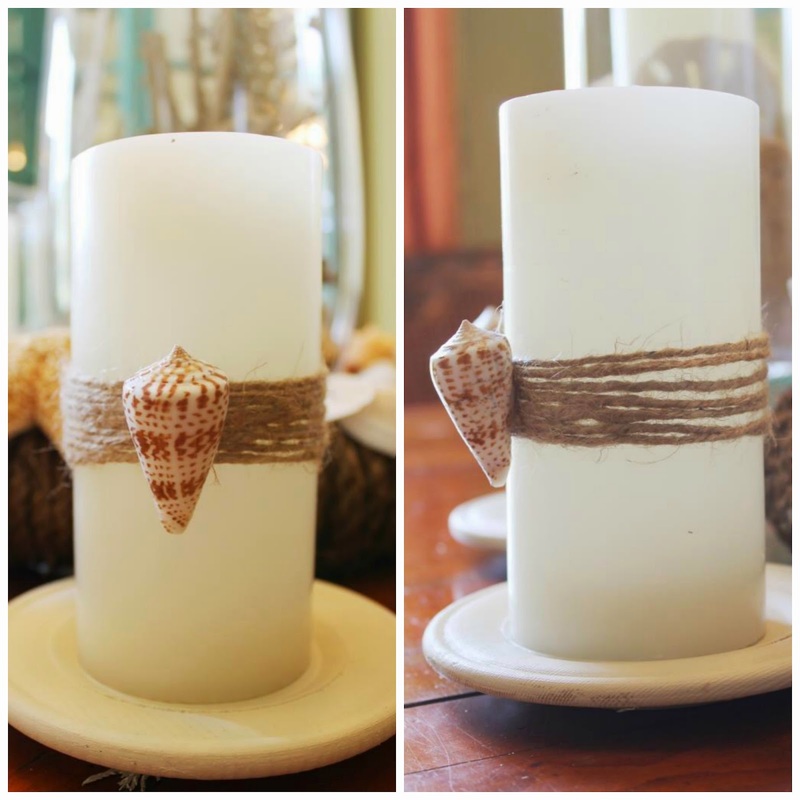 for the flameless LED candles and shells. just adding candles to the backside of the vignette. 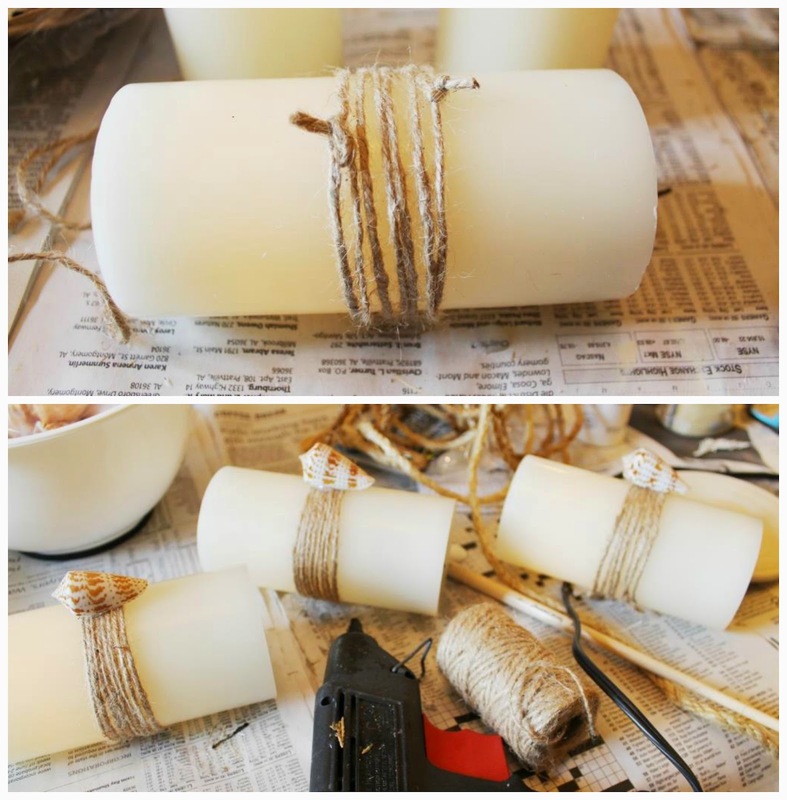 I added a band of wrapped twine on the candles. Only a small amount of glue was needed to attach the shell. I don't think it went through onto the candle. decided to take the plunge and paint it a lighter color. coral collection that is inside for this summer. I'm not good at photographing things behind/under glass. years old now and the bases needed a little love. These are faux coral made to look like Spiny Coral. fabric holds an urn with DIY starfish is on your right. shoulder and at his feet. Shells are attached to the "net". The fire place and bookcases take up one wall of the living room. the mantle and bookcases in this blog post. mirrored buffet holding a re-painted lantern. on the back side of the house. A Summer vignette was made for the kitchen table. More photos of this vignette can be seen in this blog post. A door from the kitchen leads out to our carport. at the entrance to the carport. more summer-y and use a vase filler. Tree were painted white to use on top of bottles, etc. and look like they are "dancing" on the top shelf. More starfish are stacked in vases on the bottom shelf. I hope you have enjoyed the Summer tour of my house! Beautiful collection of sea shells, which I love! I have some but not so much as you and you have inspired me with so many creations, you are so talented! Your house looks lovely and very summery! Your summer home is beautiful, Gayle. All of your coastal designs and vignettes are so stunning, and inviting! You did a fabulous job in putting it all together! Потрясающе! Какая у вас большая коллекция ракушек, так красиво все оформлено, очень сильно понравилось! A shell extravaganza! My favorite part is the mantle with the aqua accents and the shell topped bottles on the bakers rack~what a great tip to paint plastic to look better! It is so amazing that you carried your theme everywhere in your home, looks like a model home! Love your home and all of your summer decor. You have definitely done some great DIY projects. Great tutorials too. Love your summer touches, especially the fireplace mantel and the plants on the hearth! Wow, everything looks beautiful! Love your shells and summery vignettes and your hutch is gorgeous! and all your diy projects, that was really clever using the plastic starfish and painting them white. I am such a fan of coastal design so of course I love your beautiful home. Your DIY coral and sea fans are still one of the most creative projects I have seen. Wow! Your home looks fabulous. It's really giving me that summer vibe with all those shells and sailing themed accents. You really brought the beach in your home. I love it! Thank you so much for sharing those wonderful design inspirations. All the best! Loved the tour!! Thanks so much for sharing!! Thanks too your your visit and sweet words!! 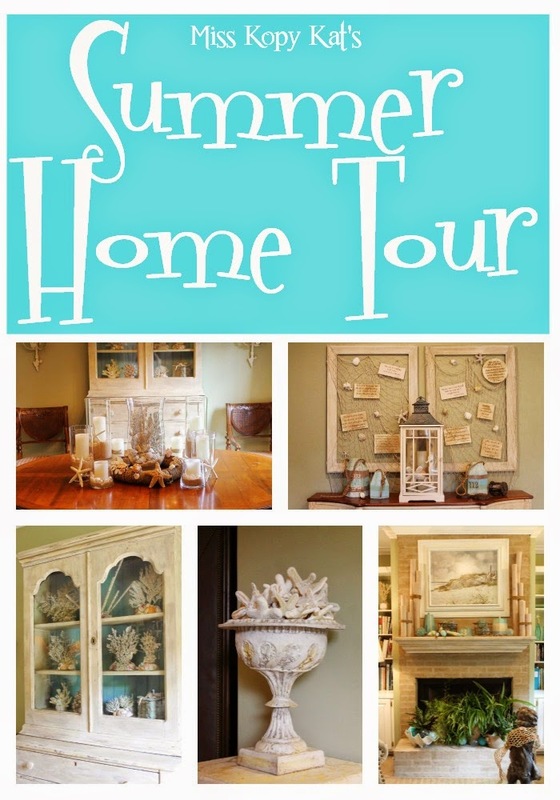 Loved the tour...your home looks beautiful dressed for summer!! A beautiful collection of seashells and magnificent marine hues! Your home is bright and welcoming. What Is "Frozen Fun" A Disney World?